ItemCUMB_2011.090.001 - Pocket Watch Owned by Jumbo (Hor Sue Mah) of Chinatown, Cumberland B.C. Item CUMB_2011.090.001 - Pocket Watch Owned by Jumbo (Hor Sue Mah) of Chinatown, Cumberland B.C. 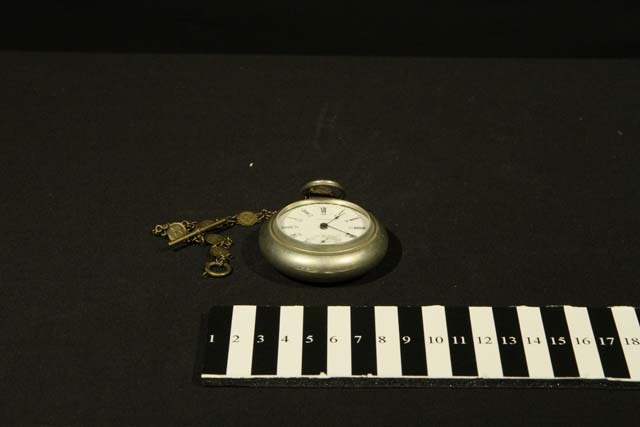 chain: 23 cm; watch: 7.5 x 6 cm diam; 1 pocket watch; metal, glass; white, silver. This watch was purchased by the donor from Jumbo (Hor Sue Mah) for $20.00.